Crete has been characterized as an area with a high wind energy capacity due to its mountainous terrain and the strong prevailing winds throughout the year. At the same time, the island constitutes the last stronghold for vulture species in Greece, currently holding the largest insular population of Eurasian griffons (Gyps fulvus) worldwide (ca. 1000 individuals). 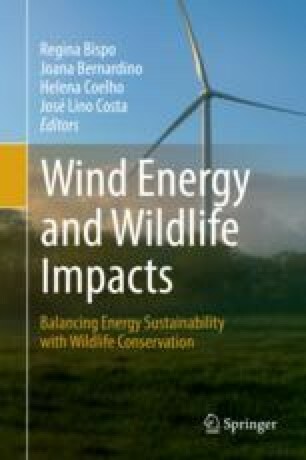 Given the empirical data on the mortality of large raptors due to collisions with wind turbine blades, the aim of the present study was to predict the potential impact of wind energy installations on the griffon vulture population on the island. The study was developed in two steps, namely, (a) the spatial mapping of the existing and planned wind energy projects up to the year 2012 and the delineation of their risk area and (b) the calculation of the annual collision rate based on the expected number of vulture risk flights and the probability of being killed. Overall, the minimum number of fatalities due to collision of vultures to wind turbines was estimated at 84 individuals per year. However, this figure could drop by over 50% if the European network of the NATURA 2000 sites was set as an exclusion zone for wind energy facilities. The study pinpoints the need for proper siting of wind farms and the prerequisite of sensitivity mapping for vulnerable species prone to collision on wind turbines.